Fluke Corporation has identified a safety issue concerning the Fluke SM100, SM200 and SM300 Electrical Socket Testers. As a precautionary measure, Fluke has decided to voluntarily recall all of these products and provide affected customers with free replacement products. We are sorry for any inconvenience this might cause you, but we hope that you'll understand that consumer safety is our utmost priority. The primary function of the SM100, SM200, and SM300 Socket Testers is to detect the presence of an open ground in a socket outlet. 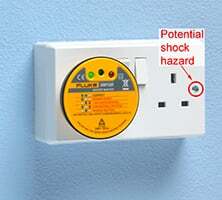 Socket outlets are often installed in metal boxes and have exposed metal parts connected to the earth pin of the socket. 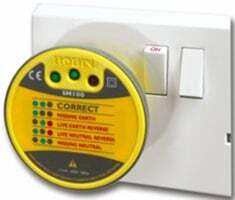 If the Socket Tester detects a missing earth condition, shown on the tester as ●○○, the internal circuitry will source a voltage from the phase conductor onto the earth pin of the socket outlet, as well as any metal parts connected to the earth pin of the socket. Such a condition can result in an electric shock to the user. The current level is probably not life threatening in most cases but could be painful and may be sufficient to knock a person down or off a ladder. A Fluke T90 Two-Pole Voltage Tester, valued at £34.99. A Fluke T110 Two-Pole Voltage Tester, valued at £49.99. A C25 Soft Case for Multimeters and a 1AC-II Voltage Detector, valued at £59.95. b. How many SM100, SM200 or SM300 Electrical Socket Testers you own. Once your information is complete and you click “submit,” you will receive an email with a printable, pre-paid and pre-addressed shipping label, a tracking number and a phone number for follow-up. Place the label on your shipping box and send to the address on the label. Your replacement product(s) should be shipped from Fluke within 3 to 5 work days after receipt of your socket testers. Click here to access the recall web page. 2) Call your local service number and request an email with a printable, pre-paid and pre-addressed shipping label. Please accept our most sincere apologies for any inconvenience caused by this action. We are undertaking this voluntary recall because we place tremendous importance on our customer's safety and the reputation of our products.